Yi Jin Jing (strengthen the muscle and build energy within Exercises) | Tundeworld! Yi Jin Jing (Tendon-Muscle Strengthening Exercises) is a health and fitness exercise handed down from Ancient China. Health Qigong - Yi Jin Jing is part of the New Health Qigong Exercise Series compiled and published by the Chinese Health Qigong Association. Yi Jin Jing exercises are thought to have their origin in primitive shamanistic rituals. Health Qigong or "Chi massage" is part of Chinese medicine for self-energy healing. It is also called internal gongfu. It is simple to learn and suitable for people of all ages. It is the most popular of all the classic Chinese Qigong meditation exercises. Regular practice can help promote physical and mental well-being, prevent illness, strengthen the body, help improve balance and coordination and even prolong life. Easy to study this fitness exercise. Health preserving Qigong is one of many kinds of Qigong. - Yi Jin Jing (易筋经）is a health preserving qigong. Yi means 'change', Jin means 'bones and muscles', Jing means 'method'. - Yi Jin Jing trains your breathing technique through body movements and keeps your psyche in balance. - YJJ strengthens your muscles and conditions your organs. - YJJ according to legend was developed by Damo, an Indian monk who lived in the Song Mountains (middle China) and lives around the start of the Christian era. In ancient China, the monk Bodhidharma recognized that the monks at the Shaolin Temple required i internal gongfu for build up energy within for self defense purpose which has been carried for thousands of years. Though the meditation exercises to guide chi flow through body meridians it not only can bring the mind in peace, training concentration, but also strengthening muscles and stretching the tendons which make the body as soft as baby. He combined Martial Arts and Dao Yin Qigong exercises to help the monks get fitter. The earliest description of the exercises is found in the Bibliographic Treatise - History of the Han Dynasty - almost 2000 years ago. A brocade painting named Illustration of Qi Conduction was unearthed in the 1970s from an ancient tomb in the central China city of Changsha. It has more than 40 illustrations of exercises identifiable as the prototype of the basic movements of the current Yi Jin Jing exercises. The movements form a continuous integrity , focusing on tendon stretching, bone flexing, and combining softness with strength. An essential part of the routines is natural breathing, assisted by calmness of the mind to make the circulation of the vital energy as unimpeded as possible. As with all Yang Sheng or ‘Life Enhancement’ exercises the focus is on the cultivation of vital energy (‘Qi’ or ‘Chi’), promoting the optimal function of internal organs and Qi circulation. Yi Jin Jing features extended, soft and even movements displaying a graceful charm and puts its focus on the turning and flexing of the spine, thus invigorating the limbs and internal organs. These movements have been proved to be able to improve health and fitness, prevent diseases, lengthen life and improve the intellect. In particular, The practice of Yi Ji Jing exercises has some very impressive effects on the respiratory system, flexibility, balance and muscular strength. It can also prevent and cure diseases of the joints, digestive system, cardiovascular system and nervous system. The Yi Jin Jing is renowned for assisting in pain relief in the muscles, ligaments and tendons in the neck, shoulders and back. Regular practice promotes physical and mental well-being, prevents illness, strengthens the body, helps improve balance and coordination and prolongs life. Each movement is accompanied by learning tips and health benefits. A brief account of the origins and characteristics of the exercises is also included. It is simple to learn and suitable for people of all ages. It is recommended from young to senior, from beginners and advanced to understand better and further Chi, body meridians and meditation. Functions and effects - It calms the mind, adjusts the breathing This routine also helps to improve the nervous system, regulate the bodily fluids, improve the circulation of the blood. Functions and effects - This routine can helps to enhance the muscles of the shoulders and arms and improve the mobility and Qi circulation. Functions and effects - This routine helps to improve the mobility of the shoulder joints, enhance the strength of the limb muscles and invigorate the overall blood circulation. Functions and effects - This routine can strengthen the waist and kidneys and has the effect of preventing aging. Functions and effects - Turning the waist and shoulder blades can stimulate such points on the back as Jiaji 17 points on each side of the spine), Feishu and Xinshu, dredge the related channels and exercise the heart and lung. Functions and effects - The theory of traditional Chinese medicine holds that "the lungs are the home of the Qi or internal energy, and they regulate the breathing. Functions and effects - As the body flexes and stretches, the passages for the Qi or internal energy are opened and closed in a rhythmical way, so that the spleen and stomach are massaged and the kidneys strengthened. Functions and effects - In addition, they enhance the strength of the waist, kidneys, abdomen and lower limbs, strengthen the Qi at the Dantian point (about the inches below navel). Functions and effects - They can also dredge the channels of the liver and Qi and smooth the mind and mood, besides improving the mobility of the waist and lower limbs. 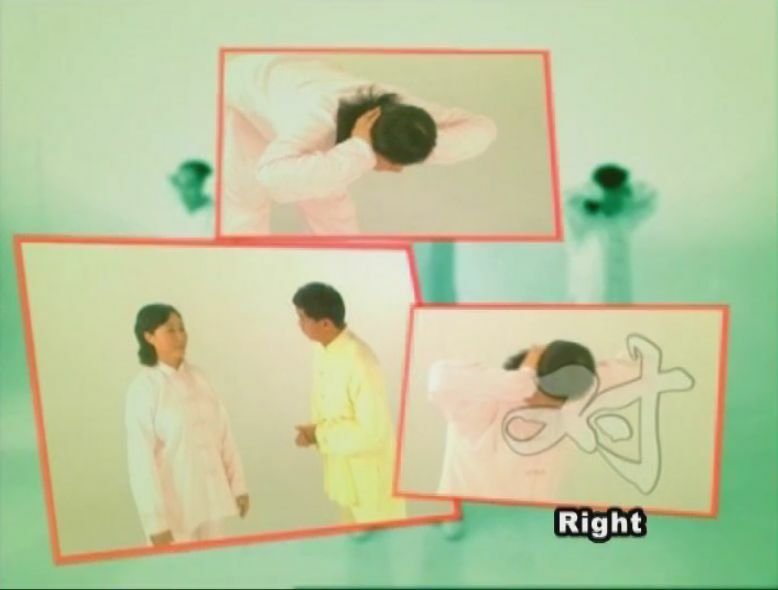 Functions and effects - The tilting backward of the body and the flexing of the chest and abdominal cavities help to dredge the Ren Mai meridian. Functions and effects - Tapping the nape of the neck helps to refresh the brain, incrace the hearing capacity and reduce brain fatigue. Functions and effects - This routine loosens the whole body for total relaxation.